Have you purchased a cast iron pan yet? Yvonne, I’m speaking directly to you! My friend Yvonne said she would get a cast iron pan once I did a post on how to maintain one. I still haven’t put a post together hoping that she will just go with it and let me explain it to her over the phone. Is anyone else interested in a post on how to maintain a cast-iron pan? If so, I will write one. It won’t be the most exciting post, but if you’re all wanting it, I will do it, so let me know. See, I’m nice that way. If you don’t have a cast iron, you have to get one. They are really inexpensive, ($22 for a 10-inch and $28 for a 12-inch) and you can use them for just about anything. I even made a chocolate chip cookie in mine. 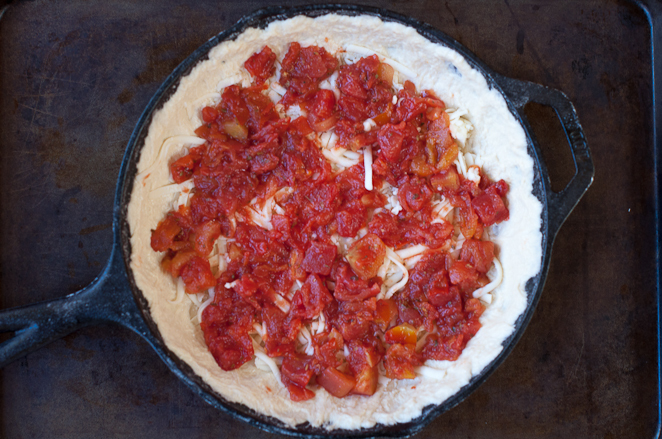 We introduced the kids to deep-dish pizza on our trip to Minneapolis this summer, and they loved it. Pizza in California tends to be thin and crisp and is usually baked in a wood-burning oven. It’s absolutely delicious, but we also love to change things up a bit and try other variations. So we were all craving some deep-dish pizza when we got back from vacation, especially one topped with pepperoni. I found this pizza and let me tell you, I’m so glad I did. This pizza was rated by John as the BEST PIZZA EVER! His words I quote, “Honey, you can make this pizza anytime, it’s honestly the best pizza you’ve ever made!” To hear that praise from my hubby, who can be a bit of a foodie at times, was a great compliment. 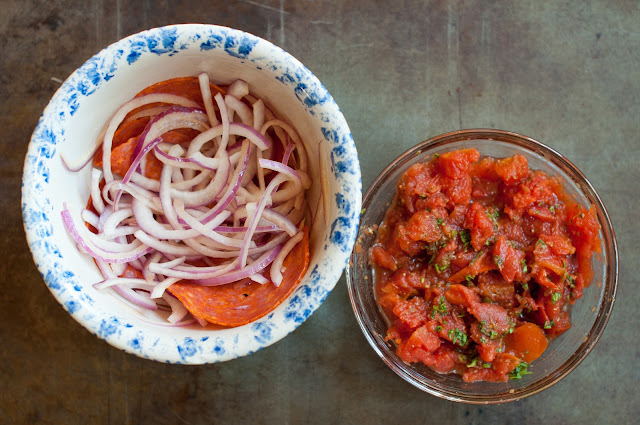 The red onions are a key ingredient to the pizza, so don’t skimp on them. Feel free to throw on other ingredients such as kalamata olives, mushrooms or red peppers. I kept mine simple, as I knew my kids wouldn’t like it with too much going on. This 10-inch pizza was enough to feed us because it’s a deep dish pizza. If your family likes a lot of pizza then you might want to pair it with a second pizza or a large salad like I did. BTW, that bunch of arugula below is just a staging prop. We had a big caesar salad with this pizza. 1/2 pound (2 cups) shredded mozzarella cheese – you really don’t have to measure your cheese, just use the amount you like. Preheat your oven to 400 degrees. Drain the can of tomatoes and then mix together the oregano with the tomatoes in a small bowl. In another small bowl toss the onions and pepperoni with 1/2 tablespoon of olive oil. Make sure your dough is at room temperature. I let my dough sit out for a minimum of 20 minutes before I use it. Coat a 9-inch, 10-inch (that is what I used) oven-proof skillet or cake pan with 1 1/2 tablespoons of oil. Make sure to rub the oil in with a paper towel. 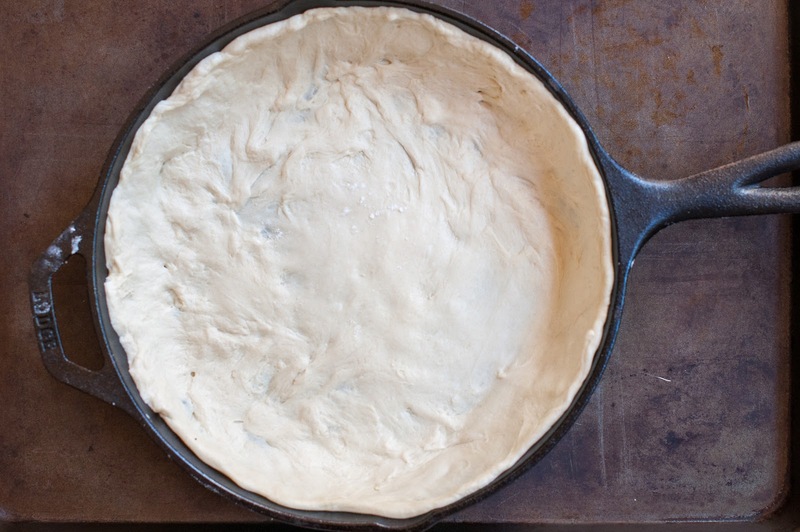 Press the dough into the pan, covering the bottom and sides. I’m warning you that this can take a bit. Sometimes your dough will be easy to manipulate and other times, most of the time, it will not cooperate. Just be patient, and know it’s not about how the pizza looks in the end, it’s about how great it tastes. Sometimes it helps to roll out your dough before you put it in the pan. 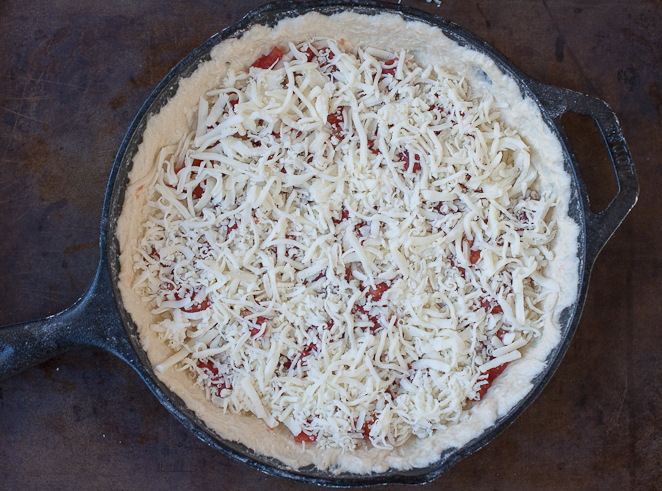 Top the dough with half of the mozzarella, then add the tomatoes and oregano mixture. Then top it with the remaining mozzarella. 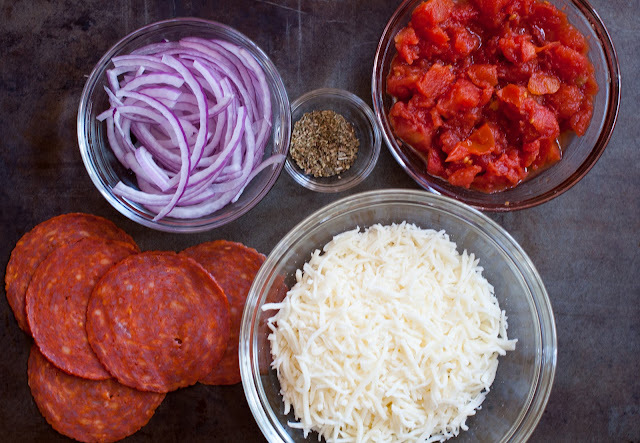 Scatter the onions and pepperoni over the top of the pizza. If you’re worried about the onions, don’t. My kids surprisingly loved the onions, and commented that they made the pizza taste amazing. Bake the pizza for about 30-40 minutes or until the crust is golden brown. It may take a bit longer than 35 minutes, just make sure the crust is brown and crispy and that the cheese is browned as well. Tip: If you want your cheese to brown up a bit more when it’s finished cooking, you can put it under the broiler for a minute or two. I sometimes do that with cheesy dishes to give them a browned effect. You may want to take a paper towel and pat out the grease in the pepperoni, as it can get a bit greasy. To get the pizza out of the skillet, take a spatula and insert it between the pizza and the pan to help slide it out onto a cutting board (you my have to jimmy your spatula around the crust a bit, but it should slide out pretty easily). You can cut your pizza in the skillet, but I would recommend cutting it on a cutting board. 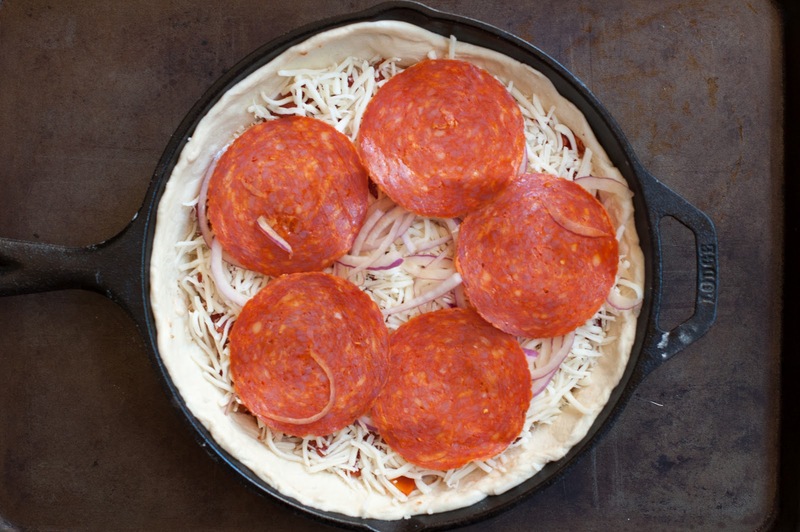 See how easily that pizza came out of the skillet. Like skillet pizzas? If so, then you need to try my sausage and arugula skillet pizza. It uses a 12-inch skillet so it serves a larger crowd, and it’s rated a 10+ in my house. Hi Jackie! Thanks so much for responding. I’ll try applegate farms – I’ve used their products before and like it. BTW, I just made your quinoa avocado and tahini wrap today for lunch!! YUM! What surprised me the most was how satisfied I was after just 1 wrap. That tahini sure does pack a lot of protein!! Thanks so much! Would love to know how to care for a cast iron skillet. Please post! Great recipe! My son, who is 17 months, helped me make this pizza and it was a big hit. We even made his own pizza in our little cast iron pan. Thank you! Em, you’re back! Yaay! I have missed you. I’m gad you’re finally getting settled. I’m sure it’s been crazy moving back and then on top of that moving into a new place. Please send me some photos of the new pad. I can’t wait to see your updated blog as well and become proper blogging buddies again. I had to laugh at your comment above because it’s hilarious and so you! OMG, you can totally do the weekly menu posts. There is no copying in the blogging world and I bet you will have these totally healthy and exotic weekly menus that I will envy, but I do know that you have Louis to cook for again so he will need his guy fare! I’m glad you like the weekly menu posts. I think they are helpful and they really help organize me. Ok, speak soon and I’m glad you’re back! Miss you! Jacquelyn this pizza looks sooo good! I have this pan on my Christmas wish list now. Tonight I made the Green Bean Shallot Ravioli for dinner. It was delicious! I used Trader Joe’s Pumpkin Ravioli. The colors of this dish were beautiful and so perfect for Autumn. The Ravioli is a deep shade of pumpkin on one side and with the bright green beans it was such a colorful and healthy dish. My kids and husband all loved it. They know your name at the dinner table now. 🙂 Thank you again for these awesome recipes. I think you should publish a cook book. I would buy it it a heartbeat! Hi Jill. You totally make me smile! Thanks so much for keeping in touch and letting me know what you’re making. I love hearing the results. I am totally going to copy you and try the pumpkin ravioli from Traders Joes, just for the color effect alone and also because I just love anything pumpkin this time of year. You will use your cast iron so much. It was my Christmas gift last year and I’m so happy I asked for it because it has made cooking so much more fun. I have only tapped into what you can make in it. Cookbook, hmmm. That is an idea. I was just thinking of doing a cookbook for my family next year with some of our family favorites recipes and give it to them for Christmas. I like your idea though. Maybe it would be a cookbook of family favorite tried and tested recipes. You could be one of my recipe testers and would thus get a free copy! Actually my dream is to open a cafe one day with a group of moms. I would call it Marin mama’s cafe (I live in Marin, so it would be perfect) and I would hire a “real” chef and have all the favorite recipes from my blog. It would be open for lunch and dinner and would have a lot of “to-go” entrees as well as order at the counter and sit down. It would be a friendly community place to hang out and pick up dinner etc. I have the idea and I’m just going to simmer with it and not worry so much about the how. Anyway, I will do a post about it one day soon! Thanks again for keeping in touch Jill. The thing I love most about blogging is the community and I love hearing from readers. Yaay! I’m so happy girl! I knew you would get one. Call me before you use it and I will give you some tips. BTW, you need a 10-inch for this pizza. You can use the 12-inch for the sausage skillet pizza. Hi Kelly! I totally remember you and I think it was Kale that brought us together ☺ I’m actually getting ready to make Zoe a kale salad for lunch. Can you believe my 12 year old requested it? I can’t! That pizza sounds amazing and I hope this pizza lives up to the amazing one you had in Iowa! Let me know how it turns out for you! Totally agree with you that a cast iron pan is a great essential for a busy mum’s kitchen. I use mine for both cooking and baking too. Hi Averie. I saw your skillet cookie and it looked decadent. I still have to perfect the 12-inch cookie and post it. My hubby is like obsessed with the pizza. It’s really cute. I love my cast iron and being that I just made that monster cookie in it, I think I need to make something savory in it now. My family would LOVE this pizza, Jackie! Gorgeous photos that just POP! I would love to see a post on cast iron skillet care. I have been wanting to purchase one, but really have no clue as how to take care of it. If I may interject…the best option is to purchase one at a garage sale. They are typically very inexpensive and you can find unusual sizes. If it has lots of baked on crap you can burn it off in the fireplace. Oiling it with vegetable oil is key. We never use soap on ours either. If it’s well seasoned, it doesn’t need it. Dry it on the stove over low flame before storing it to prevent rust. If you google ‘seasoning cast iron pan’ you can find all kinds of info on different processes. Definitely worth it effort! Great addition Jyllzie! I love the idea of purchasing a used and well seasoned skillet! Thanks for the tips as well. thanks Jacquelyn…i will be putting that pan to good use trying your recipe with it this week 🙂 do you ever use the trader joes wheat dough for this recipe? I didn’t use Trader Joe’s whole-wheat dough for this particular recipe because my kids wanted regular pizza dough, so I used their regular pizza dough. I use their whole-wheat dough all the time when I make my roasted red pepper and arugula pizza. I love their whole-wheat dough and plan on using it when I make my fall roasted vegetable pizza next week. If you prefer whole-wheat dough, then go for it. I’m sure it would taste great. You could even add some healthier veggies on top! Can’t wait to hear how it turns out for you Jyllzie!